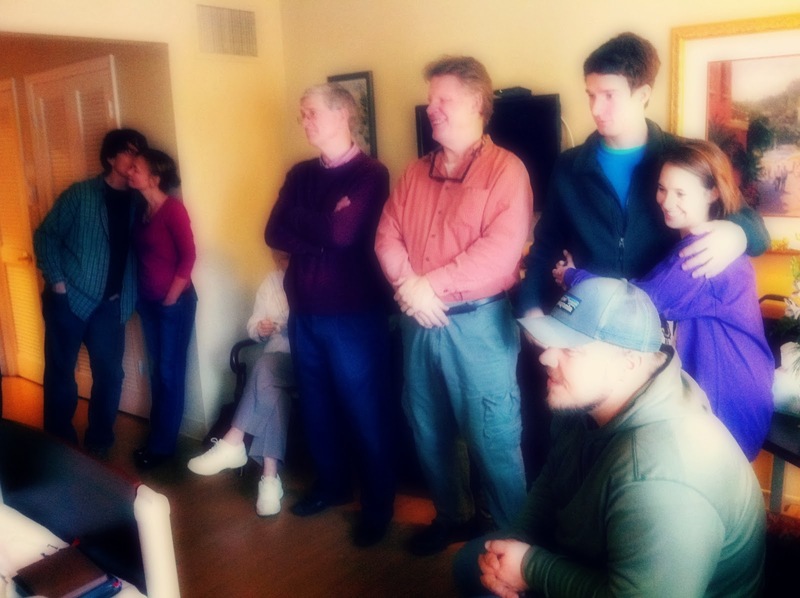 After church on Sunday, even more of us gather around my grandfather's hospice bed. We aren't calling it "hospice" when we're near him, but instead, "Park Vista" - the street it's on. Not for denial's sake, but simply comfort, not wanting him to fear, though we don't quite know what he does know or understand. Such a change for a man never afraid to make himself clear. But it's clear he knows that we are here. His wife, all five of his children, in-laws, his grandchildren. We settle in chairs, perch on armrests, lean in corners, talking and chuckling. We've always had a talent for family reunions, so in some ways this one feels quite normal. But in its depths it is charged with wild meaning, out of control, out of our hands, pushing us together now by some melding of fate and choice, fact and feeling. Grief and sorrow drift and float, watching us, piercing our hearts in random moments. Once we no longer have logistics to figure and organizing to do, they'll swoop in without question. And yet, intermingled with devastation and numbness, I can't help but feel joy. We are here. Together. We acknowledge that our presence with him and with each other rises above all other tasks. It took effort to get here, but it was an effortless decision. Joy rises through that truth, touching our connected histories, washing through the years and back to now. There have been so many greetings ("'Welcome to my parlor!' said the spider to the fly," he would exclaim with a grin when he opened the front door to us). But there is only one goodbye. And somewhere in that holy, hold-close understanding, there is joy. Again we turn to music. My aunt has a jingle bell on her key ring, and hands it off to my five-year-old cousin who keeps time as we sing the carol, kicking up his feet. One of my uncles, the oldest of the five kids, has brought his guitar. He picks bluegrass tunes of mountains and rivers, chords flowing like water through his fingers for his dad. Late in the afternoon, when most others have left, he'll play "How Great Thou Art" and "Amazing Grace," quiet but steady, focused. The son who first made this man a father. He'll stand and strum by his father's bed, next to his mother and his just-younger brother, my own dad. And I will look at them and see the small young family these four once were, starting out in life together, starting to form our big, boisterous clan. I will look at them and cherish the imagining of their beginning, and the witnessing of this sacred shift. But that will be later and right now, with so many present, it's time for "Wagon Wheel." We all belt the chorus with gusto, peppering in harmonies, picking up steam, gathering grace, a rollicking party in the midst of barely-gulped sorrow. My grandfather watches us, and I wonder what he thinks, hears, knows. I pray he feels surrounded, embraced, by melody and family, by life and love. We, his grandchildren, range in age from five to nearly 40. A scattering of plans, locations, journeys, ever strengthened and upheld by him, and by our grandmother. We don't know life without them as a strong, faithful and fun-filled unit, without him as a playmate, jokester, encourager, benefactor. I watch my cousins one by one go to sit and hold his hand, kiss him, tell him their latest news. Each one he recognizes, squeezes hands a little tighter. My burly thirty-one year old cousin, a construction worker and river guide, a traveler and adventurer, drove nine hours to get here. His large calloused hand envelopes his grandfather's, holding it tightly. My uncle then lifts the five-year-old down to put a small smooth hand in his grandfather's wrinkled one. I watch without words, grace as I've never seen it. His granddaughter-in-law, wife to one of my cousins, has been in our family for nearly twenty years, barely an "in-law" at all anymore. I watch as she approaches his bedside, petite and fairy-like, her red hair and bright eyes a beacon in any darkness. She leans down and whispers his name, smooths his forehead, holds his hand. "Thank you," she says, "for everything." That night, after church and dinner, my dad and I return. I have to drive back in the morning, and I need to see my grandfather before I go. "Okay, Pop Pop, I'm back," I announce, matter-of-fact, walking to the chair by his bed. And his eyes light up. (Hey, Claire Claire!) He grabs my hand, lifts it to his mouth. A kiss. I want to overflow, to yell, to embrace, to ache, to fix. I want to go back to being born, and start over, live it all with him again. Instead, I just keep holding his hand. My father grabs a hymnal, and we sit by his bed and sing. Standing, standing! Standing on the promises of God my savior. Standing, standing! I'm standing on the promises of God. When we get to "God my savior," my grandfather's good hand looses from mine. He raises it up, and conducts, right on tempo. Claire, this is an beautiful piece! The way you capture and unflinchingly wade through your emotions is inspiring. While I realize you are chronicling a sad and life changing event, I can feel the love and hope that radiates from being together as a family. I wish I had known your grandfather. I look forward to Part 3.